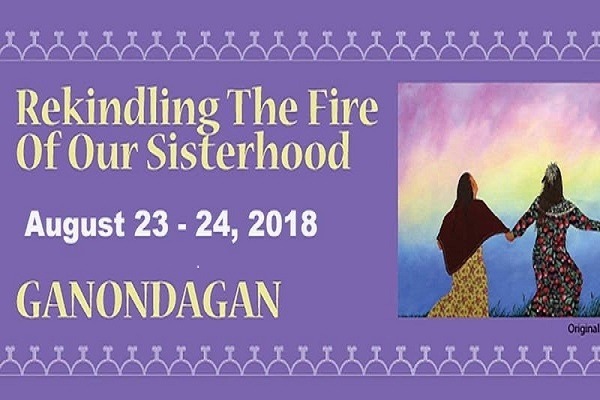 Last summer, the fire of our Haudenosaunee Sisterhood was rekindled. In a historic meeting women from across our Confederacy and Sister Nations joined in a 4-day gathering of healing. The event was held at Ganondagan from August 18-21 during the solar eclipse of 2017. Our Haudenosaunee Confederacy was founded under a solar eclipse over 1,000 years ago. Ganondagan is the lands of one of our sisters, Jigonsaseh. As the first woman to accept the message of peace from our Peacemaker, her title descended and Ganondagan became the homelands to a later titleholder of her name. Our Great Law provided the Haudenosaunee with our government, the oldest continuously democratic government in the world. Our political system and ways of life influenced the US Constitution, government, and the women’s Suffrage Movement. No small feat. In return, our people suffered at the hands of colonization. We lost many of our ways of life. Our women came together at Ganondagan to heal from these traumas that included the Sullivan Clinton Campaign, residential schools, and the taking of our lands and children. We spent four days in healing and ceremony together, as set forth in readings and in our dreams. A feast was held for Jigonsaseh, as we were instructed - to uplift all of our people’s spirits, and to help our people to follow our ways again as Onkewhonwe. Healing and love was brought back into our hearts, we now carry that in all that we do. We were instructed to meet again in 7 years when the next solar eclipse passes directly over our Confederacy, and to hold this feast for Jigonsaseh again. Until then, the women want to meet each year. The next gathering at Ganondagan is planned for August 23-24, 2018. Haudenosaunee women are the world’s most influential women, and we have the power to influence the world once again – now through the power of our unity, peace, and love that we recovered at Ganondagan. A spiritual awakening occurred at Ganondagan in 2017, and it was just the beginning of a transformative healing experience. As the women dispersed to our respective homelands, our Onkwehonwe women continue to meet and support each other. This year, we are inviting our sisters and brothers from the south to join us. Who may attend? Is there a minimum age requirements to enter the event? This is an Indigenous women led and run gathering. Please respect that this space is for Indigenous people only. We require independent space for healing. An Indigenous person is any person whose ancestors lived and were birthed in the Americas prior to 1492. Supportive Indigenous men are welcome to join us and we ask for you to be prepared to help on the ground with what is needed at hand. Any age is welcome. Children need continous supervision, they may not run around the grounds, the cultural center or longhouse without supervision. We are inviting volunteers to help with childcare - please contact us if you are interested. There is onsite parking for elders and we are looking into parking nearby - please check back for updates. Please bring $20 each day for food, which will include lunch and dinner. Please bring your own plates, utencils, bowls, cups and napkins. Please go to our facebook page "Rekindling the Fire of Our Sisterhood" and send us a message there.